So happy with my Zorki 2S, and i'm waiting for my Fed1 and my Fed3 model B to come back from the lab. This site is very well done. A must see for all soviet cams lovers! Sorry I only speak Spanish. I have a FED 3 camera has recorded the number 8391026 in the back of the body, more or less under the lens flash.En the number is 7107539. Can you tell me what year it is? Thank you. I was just browsing the web to search for information regarding ZenitE camera and came across your website. I own a ZenitE camera # 74183195 which was my fathers's. great work, thank you a lot for all your effort for us, the "small collectors" everytime in difficult with strange models....now I proudly own a Voskhod !! Beautiful web site, it is nice to see all cameras from mighty SSSR. I have zorki4 with 69032581. I'm not sure but I thing it is 3rd version A OR B, not sure. Anyway, best regards for web page and hopefully I'll send some pictures with this classic. Great site,I have a FED2 serial no.2323869, just bought it today. Great site! Thanks for putting all of this together. Saunuolis! puikus puslapis su begale naudingos informacijos! i have started my russian collection this year with a Smena8m,Zorki-4,and El.535.. all to try with new film. the adventure begins..thanks for a valuable website. Nice site!! I love soviet cams! Thank you! Great website! 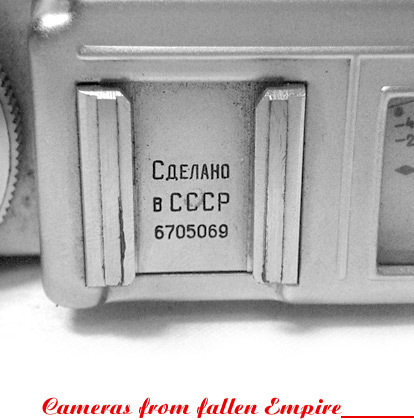 I learnt a lot about russian cameras from this as I didn't know the differences. Thanks!